A common topic among dog owners is whether we can eventually give our dog "human" foods. Of course, we can, provided however that we maintain a balance between 'human' food and dry food. That is, you can make dry food more interesting by mixing it with some vegetables or using a piece of fruit as a delicacy instead of a dog biscuit. Also, if your dog is experiencing a weight problem, it's a good way to start him on a diet. This raises the question, which foods dogs can't eat? Below we list which foods are allowed and which are not, but since each dog is different, before giving him anything you should ask your vet. The only milk that dogs need is the mother milk for the first 2 months of their life. As a puppy grows, the enzyme that cleaves milk lactose, lactase, decreases progressively. Consuming milk from an organism that can not break down lactose results in pains in the intestine, bloating, and colitis. For this reason, after a gradual weaning, you should not give milk to your dog. If you need to give milk to an orphaned puppy, prefer a special milk substitute for dogs. Cow's milk does not have the right proportions of nutrients for puppy development. If you do not find a dog substitute and you need to feed a puppy, donate concentrated cow's milk (box) without diluting it, or even better, goat. Attention: The only case that you are allowed to give milk to your dog, it is when he has eaten and you want to him vomit. Contrary to what most people think, no bone is suitable for the dog's diet. Not small nor big. Not from beef, nor from chicken. Neither raw nor boiled. It is not in the nature of any mammal to eat bones. Bones have no nutritional value. It's just a good toy for the dog. a) Teeth: Not only do teeth not clean while eating bones (as many incorrectly believe), but they wear and tear. b) In the esophagus: Continuous irritation of the esophagus leads to chronic esophagitis. Also, some bone can stick to the esophagus and pierce it. c) Stomach: Bones irritate the stomach causing acute and chronic gastritis and ulcers. d) In the intestine: A large piece of bone can clog the intestine causing ileus, which is very dangerous because if no action is taken, the dog dies within a few hours. Also, sharp bones can cause bowel perforation and death from peritonitis. But small bits of bones can also be harmful. If they are mixed in the stomach and the intestine with food, they will form a compact and hard mass that can not be promoted with peristaltic bowel movements. The result will be constipation, ileus, and bigpox. Even if the dog's life is not threatened by bones, it will surely cause colitis from colon irritation. This situation is not dangerous, but it is difficult to cure completely if it ever starts. The dog will be prone to colitis throughout his life. No matter how strange, canned food is not good for dogs. They contain abattoir products not intended for human consumption, enough fat and a small percentage of meat (if you read how small this percentage will be surprising). They also contain preservatives and flavor enhancers. As you understand, these ingredients are not quality food, they also cause dyspepsia and colitis. While raw olive oil is an excellent source of vitamins A and E and omega-F fatty acids, fried oil causes colitis. 5) Fats in large quantities. 6) Sugar in large quantity. First of all, to clarify that "sweet and chocolate cause blindness to dogs" is a myth. Dogs, like us, can fearlessly eat something sweet in a reasonable amount. You understand that a 10 kg dog does not eat a paste that is a human portion of sweet. Consuming a large amount of sugar can cause a seizure, while daily consumption of sugar results in obesity. What ultimately dampens is diabetes that will suffer from excessive sugar consumption. Correspondingly, chocolate that the body can not disrupt will end up covering its liver. Pepper and other spices cause acute or chronic gastritis and colitis. When in a sauce, you can remove it by rinsing the food with water. Most foods alone have a small amount of salt. You do not have to add more. Salt generally makes kidney bad and many dogs become addicted to it while increasing hyper-mobility. You will use it only to cause vomiting in the dog that has eaten something poisonous, but again as the last choice. It is best for milk for this purpose. 10) Raw meats and raw vegetables. The reason why you should not give your dog raw meat/chicken/fish/eggs and raw vegetables is exactly the same for which we do not eat and raw: food poisoning from various microbes such as Salmonella, Campylobacter, Caulobacter, Clostridium, Listeria, Staphylococcus, Toxoplasma. Food poisoning is diarrheal, abdominal pain, vomiting, fever, etc. It can also be fatal. 11) Chips, shrimps and other snacks. Conservatives, colors, lots of salt and sugar are found in these foods. They should not be included in both your dog's diet and the dog's diet. They should be avoided even in small quantities because they cause acute renal failure and death. You can give your dog any meat, cooked lightly, like cheese or a little yogurt (if your dog is not intolerant to lactase). Also, peanut butter is a perfect candy for the dog, but you prefer what has a low salt content. You can also put rice or a minimum amount of macaroni, always neat or cooked in a natural broth. Usually, this is how the dog's diarrhea is treated naturally. Your dog can consume supplementally in his diet: green beans, cucumber, spinach, broccoli, cauliflower, lettuce, pumpkin, parsley, cabbage, pumpkin, banana (amazing source of potassium and calcium), pear and apple or peeled), mango, melon, pineapple, strawberries or any "berries" (rich in antioxidants) and black olives without peanut. You can also give red pepper, which is rich in iron (not hot), as well as beetroot which is especially beneficial to the dog while cleaning his liver. The carrot: It is the best you can give your dog, always raw. You can give it to him as a "candle". It helps to have a good condition of teeth as it cleans them naturally, but it also offers a proper diet. Never give your dog onions, garlic, mushrooms, leeks, avocados, grapes and raisins, peach and apricot, any citrus fruit and seeds of any fruit. Finally, because dogs have difficulty digging vegetables, we need to make it easier for them. If we choose to give them the vegetables that are allowed, raw, we should rub them on the grater or mash them. Otherwise, we can boil them a little (so they do not lose their nutritional value) and chop them. We always offer them along with dry food. Generally, if you have chosen a good dry food, your dog's nutritional needs are covered. 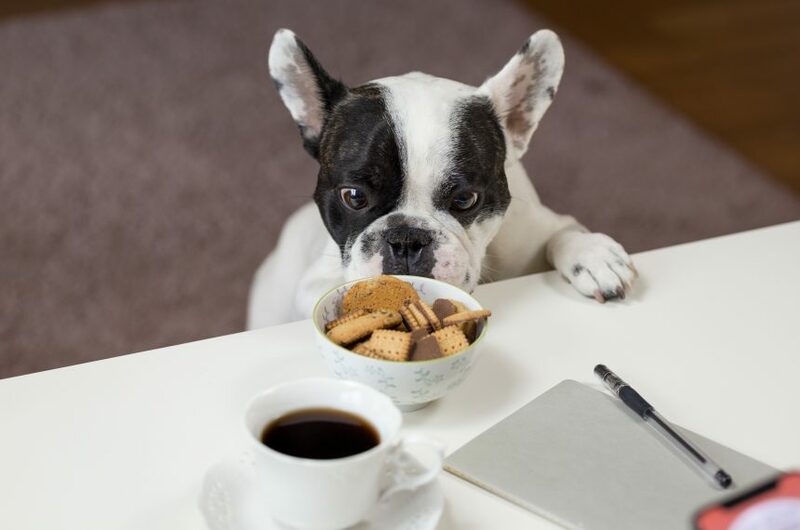 If you want to reward it or just give it a more interesting flavor, use one of the above suitable foods, but always remember to remove the amount of daily amount of dry food your dog is eating to avoid weight problems.